Xiaxue VS Silver is so yesterday. 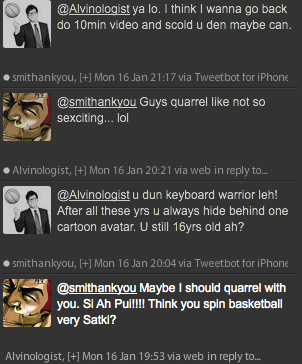 Alvin VS Smith is THE news ~ Smithankyou - Lifestyle and Travel Photo Blog. I think this is one of the hottest gossip in the blogosphere this few days right? So our Blog Queen XiaXue went and slam another CB (Chio Bu) blogger Silver Ang about some thing she did(Or at least according to her source. Yah hor, as a blogging queen she should have stated her source right? Or else also like not very credible.). As I am very sure they are much much more popular than I am, I do not think there is a need for me to hyperlink their brog when I mention them. Read it from Alvin's blog if you are interested. 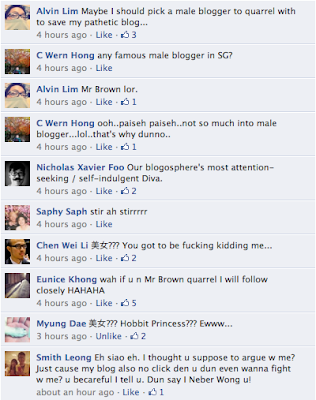 See, I need to hyperlink Alvin's blog cause although I like to read his blog but his blog not as popular. Why? Cause we have no cleavage to show or maybe cause two guys fighting ain't as interesting. You don't believe me? We had this discussion over twitter earlier today and we decided to try it out. So after he scold me ah pui and all and wanna fight with me, he still went on to facebook to look for another argument. But he see me no up and only wanna fight with Mr. Brown wor. No give me face? So now what? Cause Mr Brown can make video than he more interesting meh? You think I cannot make video? Okay, I admit Mr Brown more popular than me, cause people mentioned by Minister so I bo wei gong lah. But because I am jealous so I am not hyperlinking his brog also lor. But I ish can make beedio too hor! I nailed this video in Aaron Tan Nina Wantyouonly Style! BAM! So anyway, jokes aside. I am not surprised that such things happened online within the blogosphere. Our blogosphere is just pretty much like a very big organization where everyone works in but for different client and different purpose. I am sure there are a lot of people out there who do not see eye to eye to another blogger/tweeple online. In fact I am very sure there are a lot of people out there who doesn't like me but I mean we do not need to tell the whole world how we feel about everyone right? In fact I am sure some of your guys who are reading this post will automatically link me up with one of the person who I had a little "history" with online previously. Too bad none of us is as popular as these two ladies, else we would be on the papers too. Or at least I am very sure that is what he wish. All I can say is that we are all humans and we all have differences and there isn't a need to iron out everyone one's difference. I do not hate him as a person but probably just do not agree to his action over certain issues but end of the day I do not see a need to create a post to tell everyone what action of his turns me off. Although I have never met XiaXue and I am friends with Silver, I am taking this very objectively. I am sure some of you who are reading this must be thinking that I am saying this is simply because I dare not offend XiaXue. No, I do not have this kind of "fear" within me and who am I to offend her anyway? I am not at all surprise about how some "younger bloggers"(sorry I can't find a better word) will feel that there is a power distance between the popular bloggers and the "not-so-big-time" bloggers. This "caste system" is inevitable thanks to marketing people like us which I am not totally not proud. It is the numbers that we are looking at when it comes to KPI calculation but end of the day we are all humans. I have very close friends who are "bigger time" bloggers like dweam, holly, beatrice, nadnut (dont ask me why all ladies) and a few others but that doesn't make them being a snob when they see me. I still remember how we become friends. No, I am not defending XiaXue but I am saying that caste system does not work in making friends, less clicks or less followers does not make you a lesser person. All these could just happened simply because of a few small misunderstanding. End of the day, I felt that although we know each other through online and all, there are things that we can take it off the internet and work it out without making a big fuss online. Unless getting (in)famous is one of your target for blogging. I always preach this to every blogger is that, blogging is an interest for me, it is a hobby, not a tool to get rich or get laid. (Although I do not mind the latter happening). Hope you guys enjoy blogging at it's purest which is simply writing. Mr.Smith, I WONG YOU HOR! Tonight I give u my blog response to PWND u dip dip. ya lah! ok ok.. edited liao. U better send me soon hor! I give u only 2 days or else i will find u.